Custer County is the tenth-least populous of the 64 counties in the U.S. state of Colorado. As of the 2010 census, the population was 4,255. The county seat is Westcliffe. Custer County was created by the Colorado legislature on March 9, 1877, out of the southern half of Ula, the county seat moved to Rosita in 1878, and to Silver Cliff in 1886 before settling in Westcliffe in 1928. The county was the site of a silver rush during the 1870s. Thousands of men poured into the county during this time in the hunt for silver. Some of the notable mines include the Geyser Mine (on the north edge of the town of Silver Cliff), the Bassick Mine (near the ghost town of Querida) and the Bull Domingo (north of Silver Cliff). During the late 19th century a railroad line was connected through the Grape Creek Canyon but was permanently closed after a few disastrous floods. The old railhouse has been turned into a historical landmark in the town of Westcliffe. After the mines were exhausted, the population dropped considerably and was replaced by cattle ranchers. An extensive system of irrigation ditches was built throughout the valley. Ranching in the Wet Mountain Valley continues to this day. According to the U.S. Census Bureau, the county has a total area of 740 square miles (1,900 km2), of which 739 square miles (1,910 km2) is land and 1.3 square miles (3.4 km2) (0.2%) is water. The county is very rugged and would be virtually inaccessible without roads. The lowest point of the county is around 6,000 feet (1,800 m) in elevation, but most of the county is rugged and mountainous. The county seat of Westcliffe is about 7,800 feet (2,400 m) and along with nearby town Silver Cliff lies in the Wet Mountain Valley which sits at the base of the Sangre de Cristo Mountains. 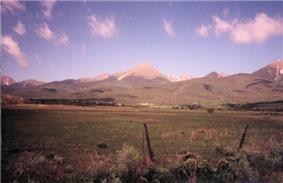 The peaks of the Sangre de Cristo Mountains to the west reach heights in excess of 14,000 feet (4,300 m) with Crestone Peak being the highest at 14,294 feet (4,357 m) and 7th highest fourteener in Colorado. A large percentage of the county is National Forest land in the Sangre de Cristo Mountains on the west side and in the Wet Mountains on the east. The only lake of size is the Deweese Reservoir in the north end of the Wet Mountain Valley. As of the census of 2000, there were 3,503 people, 1,480 households, and 1,077 families residing in the county. The population density was 5 people per square mile (2/km²). There were 2,989 housing units at an average density of 4 per square mile (2/km²). The racial makeup of the county was 95.89% White, 0.37% Black or African American, 1.11% Native American, 0.29% Asian, 0.71% from other races, and 1.63% from two or more races. 2.51% of the population were Hispanic or Latino of any race. There were 1,480 households out of which 25.50% had children under the age of 18 living with them, 64.60% were married couples living together, 5.40% had a female householder with no husband present, and 27.20% were non-families. 23.80% of all households were made up of individuals and 7.90% had someone living alone who was 65 years of age or older. The average household size was 2.36 and the average family size was 2.77. In the county the population was spread out with 22.50% under the age of 18, 4.50% from 18 to 24, 23.30% from 25 to 44, 35.00% from 45 to 64, and 14.80% who were 65 years of age or older. The median age was 45 years. For every 100 females there were 104.30 males. For every 100 females age 18 and over, there were 102.00 males. The median income for a household in the county was $34,731, and the median income for a family was $41,198. Males had a median income of $32,460 versus $20,868 for females. The per capita income for the county was $19,817. About 9.80% of families and 13.30% of the population were below the poverty line, including 20.10% of those under age 18 and 12.60% of those age 65 or over. There are several other public offices including Coroner, Sheriff, County Clerk and others. Custer County is overall very conservative and heavily Republican. The most important election is not the Pete Coors. Despite the surface appearance of a homogeneous political culture, there is considerable dispute among residents over planning. One segment of residents (which includes ranchers) would like to see the County preserved in its present state as a mountain paradise with its rural ranching culture, with strict limitation on development. Proponents are sometimes seen as "anti-growth" and "anti-property rights." Another segment of the population would like to see less government and less restrictions on growth and development for the growth of business and the economy. Proponents are seen as "anti-environment" or "anti-agriculture."